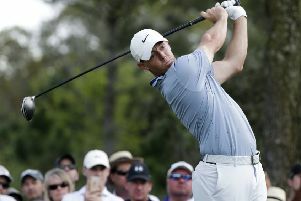 McIlroy followed a 5&4 victory over American Luke List with a 3&2 win against South Africa’s Justin Harding and will seal a place in the knockout stages if he avoids defeat to England’s Matt Fitzpatrick today. Woods conjured up a miraculous escape from under a bush on the 10th with a left-handed shot played on his knees but pulled his tee shot into the water on the 13th and crucially failed to match Snedeker’s birdie on the par-five 16th. Woods will need to beat Patrick Cantlay today and hope that Snedeker loses to Aaron Wise, whose defeat to Cantlay ended his hopes of progressing. McIlroy told Sky Sports: “I feel good. If anything I played a little bit better today than I did yesterday. “Justin put up a really good fight, I had to make a few birdies just to hang in there on the front nine, and to finish with two birdies on 15 and 16 was very nice. “One of the big things over the last couple of days is responding to good shots they hit. I feel I am playing a good shot when I have to. “I held putts when I had to and I finished off the match on Wednesday with two birdies and I did the same today,” he added.